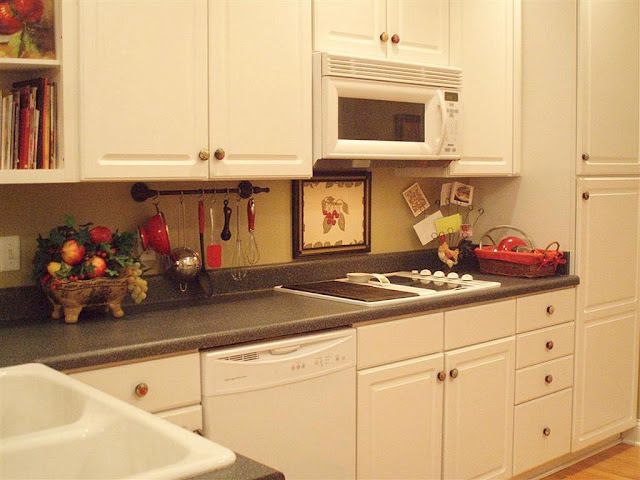 Blackberry House blog retail shop projects and painted furniture: My Kitchen Reveal! Layla, and we ALL know who she is, is having "A Few of My Favorites" Party, and today is the Room Remodel addition. Since my kitchen is the only room I've actually completed this year, I guess that's the room I'm linking up! When you're done here, go back over there and see what everyone else has done. I'm amazed at the makeovers I've seen this year and can't wait to see them all in one place. 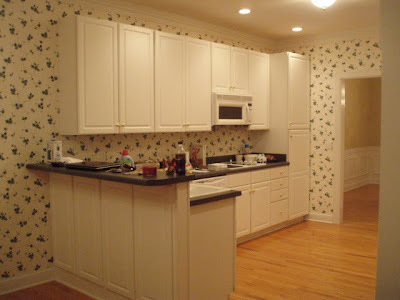 Here's my long-time-in-the-making Kitchen Reveal! I've been hacking away at it here and there since we moved several months ago, and I've finally got it ready to show! The pictures speak for themselves, so I won't moderate too much, other than to point things out along the way. Let's look at where I began, shall we? 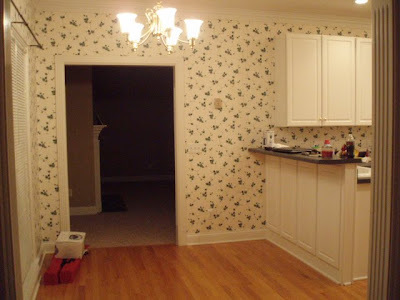 Never fear, I got rid of that wallpaper.........and it only took me 4 months of scraping, washing down the glue, patching all the drywall (a story unto itself), priming, and painting! Scrub Stains out of Hardwood - All I can say is I tried! I've been a busy girl, and I have the aches and pains to prove it. The one thing I thought about doing was changing out the light fixture, or paiting it, but in the end I decided not to. 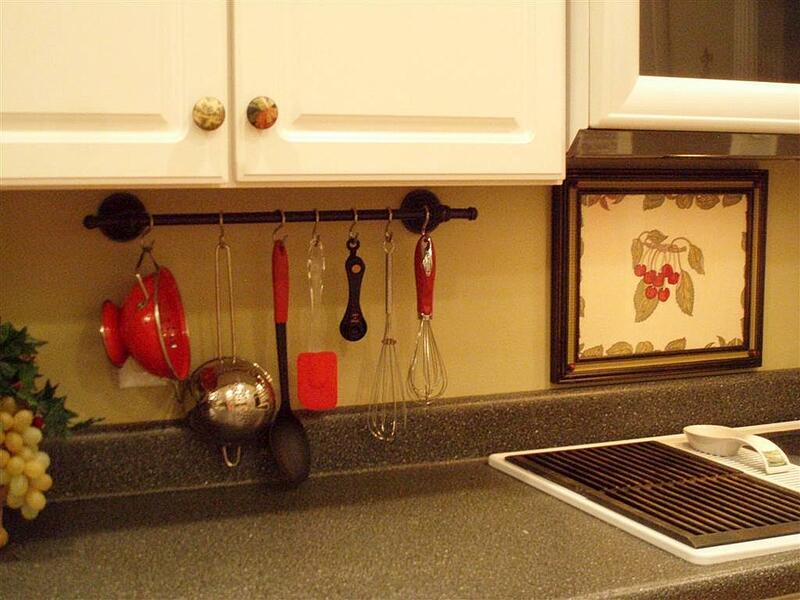 We're leasing this house, so I figured I'd just do cosmetic things to enhance the kitchen without spending any money. The only thing I had to buy for this makeover was the wallpaper stripper and scraper. I had everything else leftover from prior projects or laying around my storage room. So that makes this a doubly special makeover! 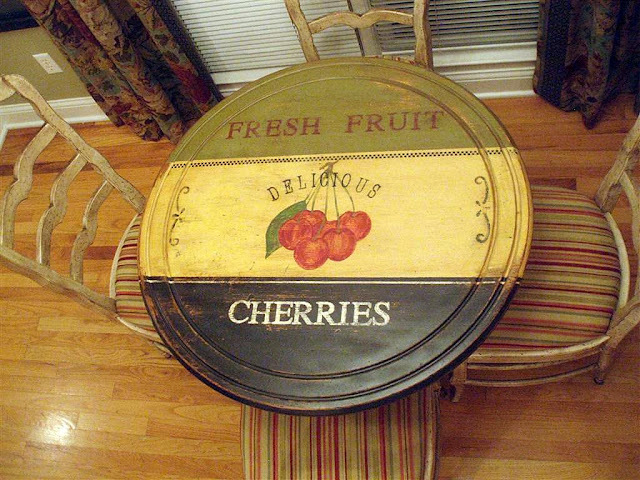 Remember this table? It's the SAME one! I'm so proud of how this turned out. Full tutorial to come in the next week. There you have it - all done! 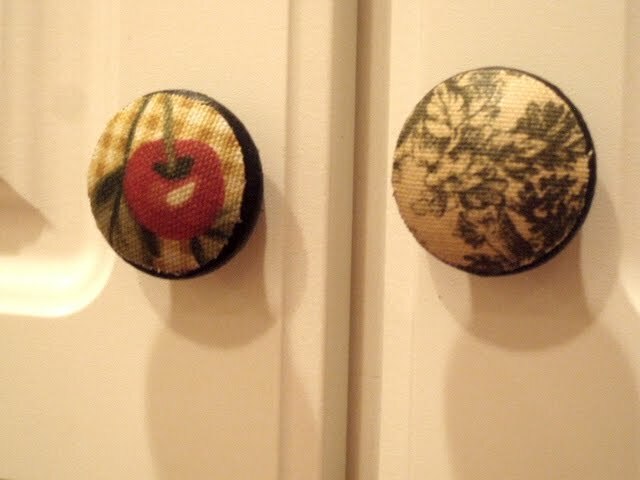 Tutorial for Fabric Cabinet Knobs found here. It is looking beautiful and I can't wait to see the rest of your photos. Wow Polly... beautiful! Lookit you go with this deadline! You smoked! Love the colour of your walls. Sooo pretty! Bet you're in an absolute daze that it's the same room! I think it's fabulous! The room looks so much bigger without the wallpaper. The drapes are beautiful! Now can you come take down the wallpaper in my bathroom? I peeked in your hallway;) I love your clocks on the wall. Can I get closer for another peek? Very nice! The table is fantastic. So many good ideas. absolutely fabulous~!! this was a joy to view..
Wow Polly!!! It looks fabulous! Love the color and that kitchen table is amazing!! Hi Polly...LOVE your decorating style. Everything looks fabulous! found you by a post you made saying you had told how to remove the number from the "Followers" block and came searching for that. Unfortunately Blogger has changed it's format and I can't figure out how to do it now. HOWEVER I have been reading your blog and am very thankful that I did. PS I can't figure out how to follow you LOL so I am adding your blog to my sidebar. Very elegant, but with some whimsy. Love it! Oh Polly! 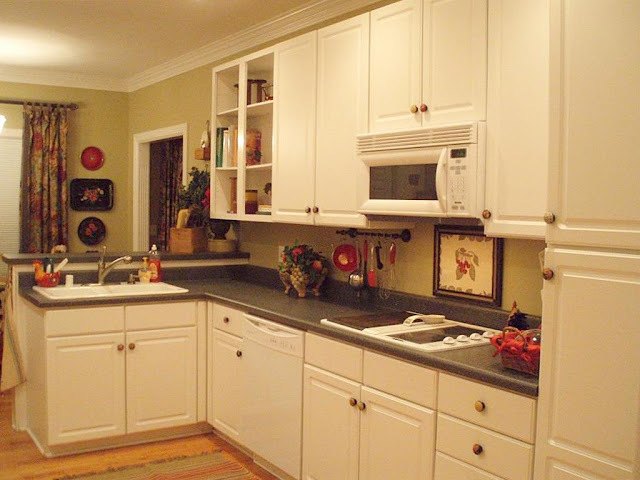 Your kitchen looks Fantastic! I Love the color combo! Love it!! I am off to read more posts to get other great ideas. Oh my word! The ivy is gone! I can't wait to see it in person - it looks FABULOUS! A. MAZING! I felt like I was flipping through a BHG mag!!!!! It's so beautiful!!! The doorless cabinets really open up that little section - like a window!! That wirey thing holding recipes??!!! OOOOOH OOOOOH!!! I have one of those collecting dust downstairs!!! I want to hug you so big!! I NEVER thought of using it for that!!! No more struggling with pieces of paper and cards on the counter! Big kiss!! The color of the walls??? Love it! The seed boxes are wonderful! You've got the touch!!! I LOVE all your clocks on the wall in the background (LR?) too!! And that green cupboard is to diefor!!!!!! My favorite green in all the world!!!! The table. OK. When I got to the table. I let out a little early morning scream!!!!! It is stunning, jaw on the floor, stunning!!! YOU'VE GOT IT. YOU'VE GOT IT. And I'm so glad to know you and learn from you and be your friend! I'm so happy! Peep!!!!!! 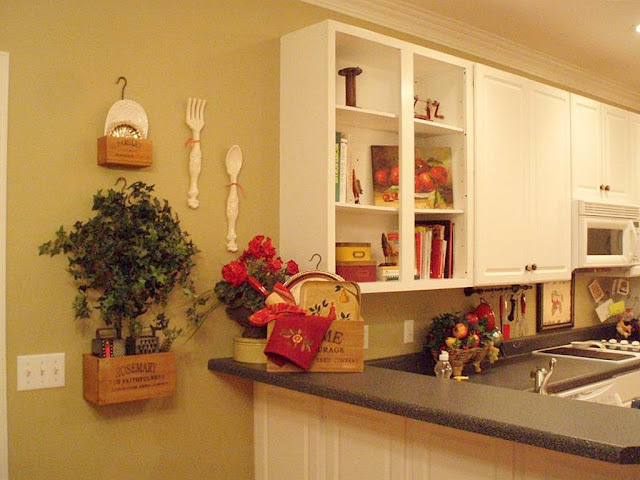 Love your kitchen makeover...could you tell us the paint color and also where did you purchase the wooden boxes that are on your wall and counter? Thanks for the inspiration. Polly, your kitchen is a DREAM! All of your hard work - WOW! Every little detail is truly gorgeous! 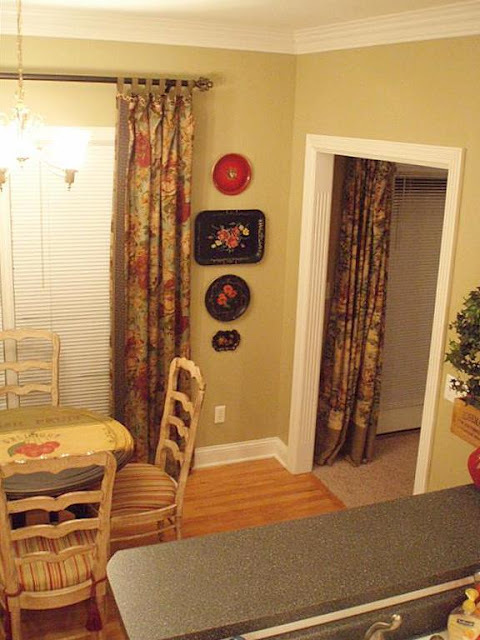 So full of character and personality and not cluttered a bit! You are my hero! 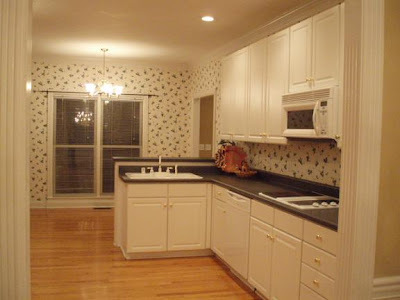 Your kitchen is wonderful, Polly! 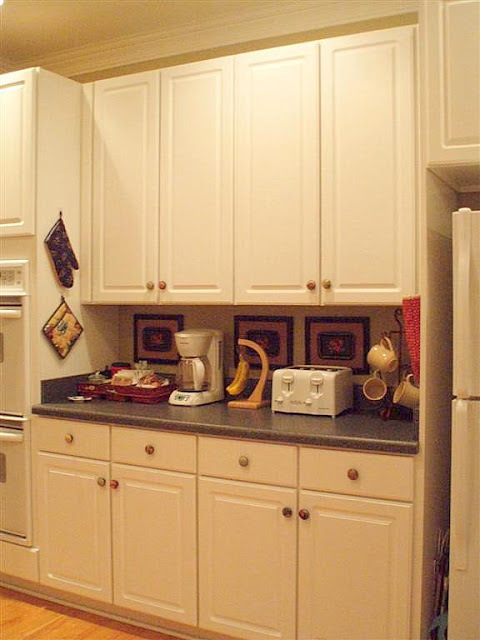 We have the same cabinets, but you have so many more. The storage must be great. I am CRAZY about your green cabinet. Your table is very creative. A lovely warm kitchen. Thanks for sharing. Love it all. I can't wait to hear about that darling table. I love that green cabinet, so cute. 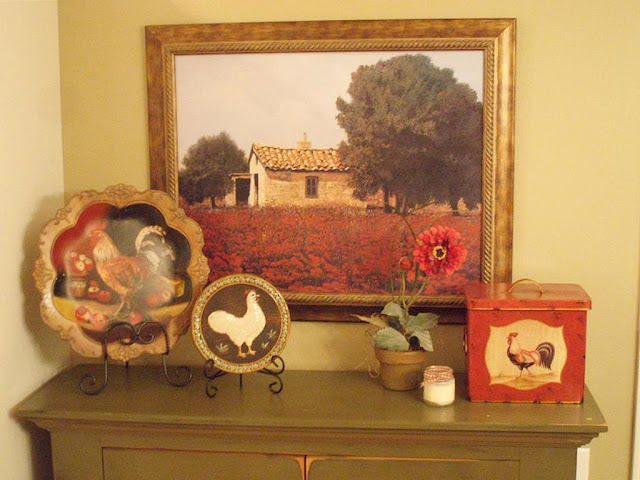 I hope you will be showing us the other rooms too, I can see a clock collection on one wall that looks interesting. Thanks for sharing that, I love it. It looks SO good! I once lived in a house with big ivy vines all over it so I definitely feel your pain. The color on the walls is Behr Ryegrass #390F-5, from Home Depot. The stacking crates were won in Shabby Chic Cottage's Spring Fling from a gal with a shop called The Floppy Cow (www.thefloppycow.blogspot.com), but I just checked and she doesn't have them anymore. The tutorial on the table is coming tonight! OH....glorious encouragement! 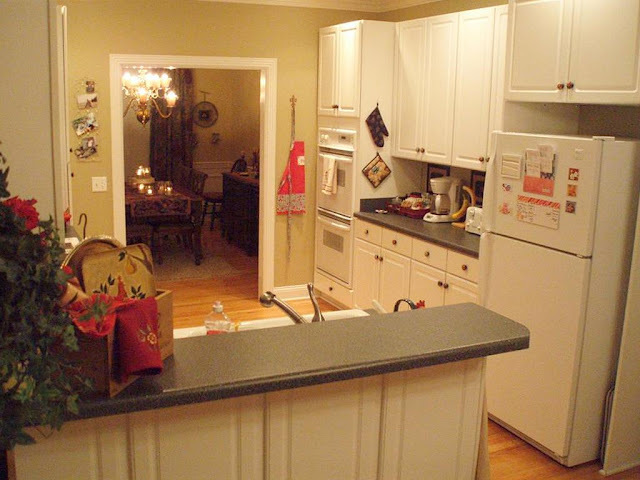 I sit here typing and looking at my "before" kitchen that makes your before kitchen look magnificent! Your "after" kitchen is wonderful, great job!!!! Your table looks amazing. I think that's my favorite part and the draperies ! What a difference the wallpaper made! 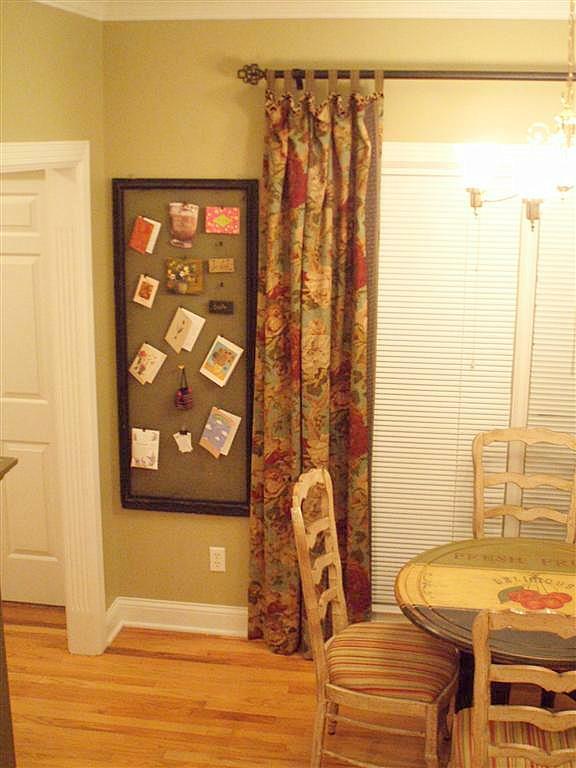 This makeover was tremendously worth the work(going by those befores and afters). Like everyone else, table tutorial please!! Absolutely beautiful!! I so understand about the wallpaper...yuck. I did a huge, vaulted wall in a former residence and it was a challenge. I was so proud of "me" when it was completed though. I know you must be extremely pleased. You deserve tons of kudos for all your hard work! I can't wait to see how you did the table. You are very talented and creative. Wow Polly! What a fabulous job you did! It looks great! I love the table! I love all the special touches. Definitely worth all the work you put into it! You have lovely taste and you are VERY talented! I just found your blog and all I can say is WOW!!! What a beautiful transformation! I just love how it turned out. Great job and very talented. 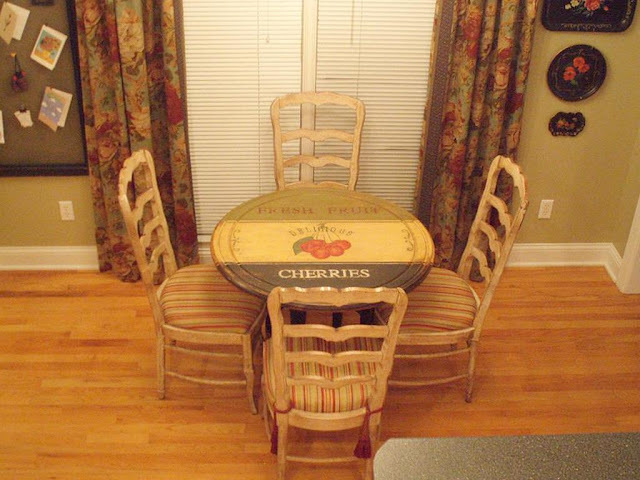 Oops, this is comment #2--I scrolled right by that amazing table!!! I can't wait to see the "how to". Wow! I got inspired when I saw that towel rack used as an utility rack! 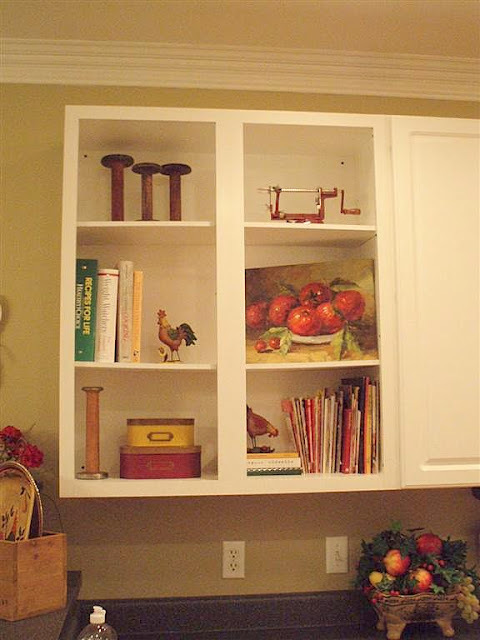 I love that idea and will look for bargains and hang under my cabinet! 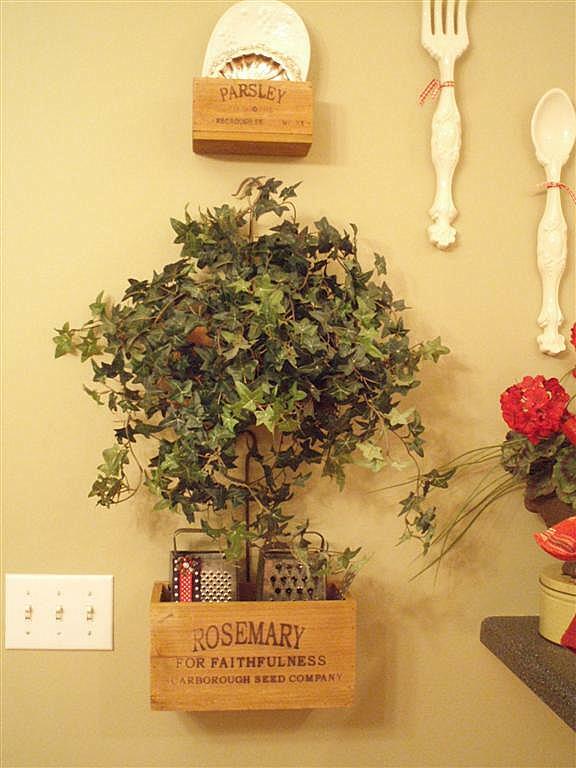 Unfortunately, my backsplash is tiled, so I'll have to hang it directly under the cabinet itself, but it should still look great and not clutter up counter space (my utility items are in a vase)! You did great! And you're leasing the place?! 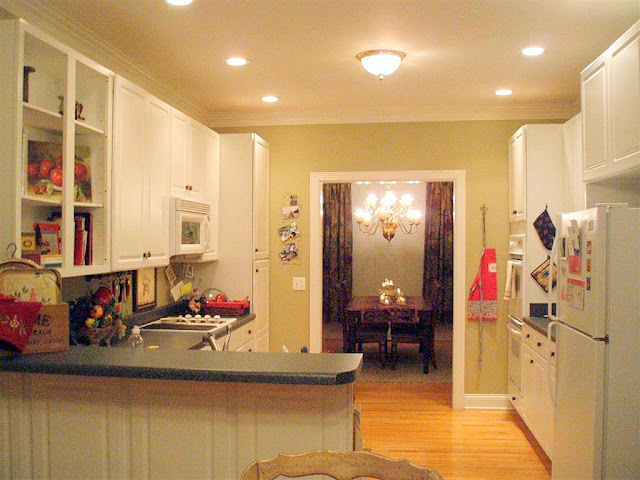 I bet you light up and smile every time you step in your "new" kitchen now! first time to view your blog....very excited to be here. 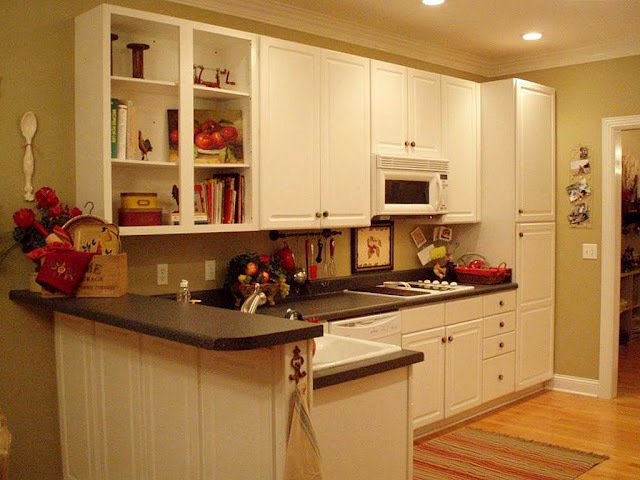 your kitchen is just beautiful! love the table. WOW! Everything is just beautiful! I love your table to pieces and can't wait for the tute. 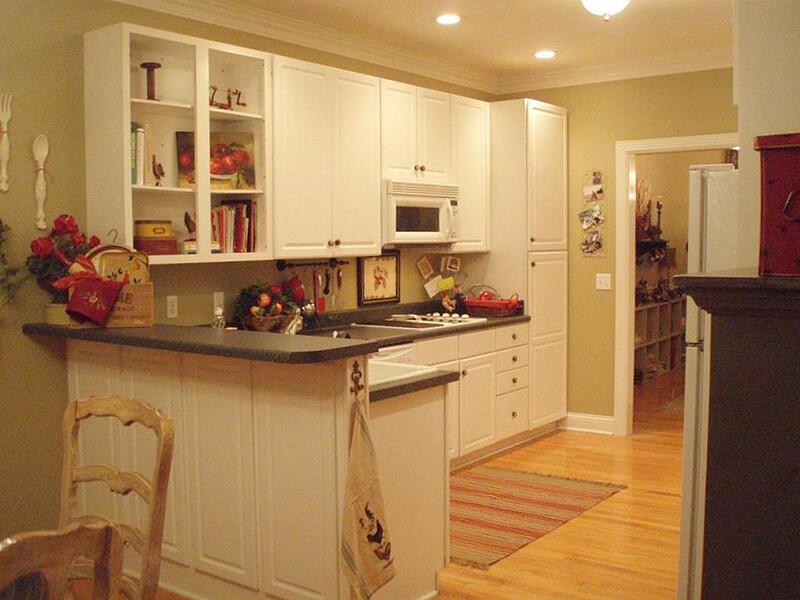 You did an amazing job transforming your kitchen, so warm and welcoming and full of awesome special touches. Conversation pieces everywhere - love it! 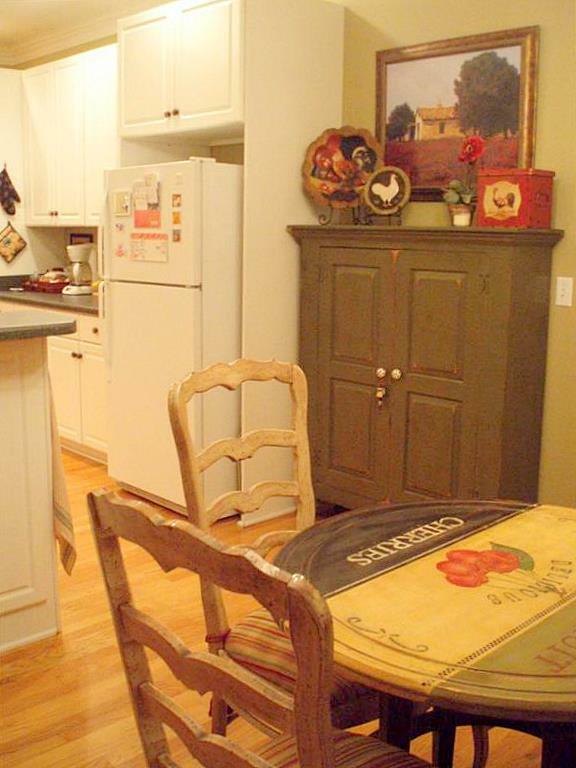 This is one of the most charming kitchens I have ever seen. WOW! You have truly created a beautiful room. Great job! 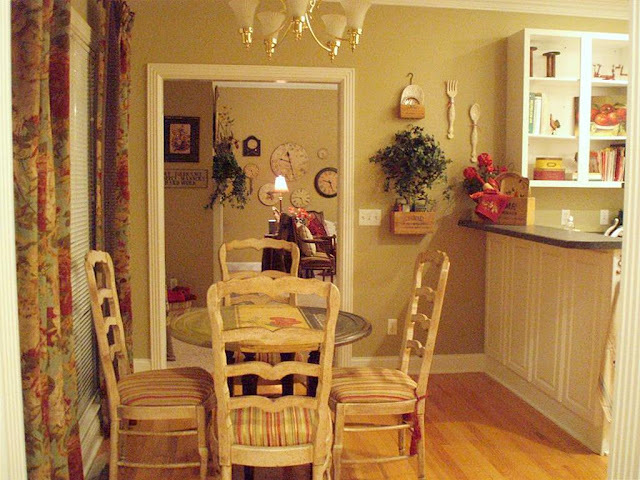 Love the white hanging utensils. Precious! Your blog is wonderful! It's so nice to meet you. I hope you stop by and visit me anytime. First, I love your boxes of kitchen supplies with the wording of spices on them! Second, I love your vintage utensils under the cabinets hanging on the rod, I wonder if I have room under mine? Hummm? You know, I do have several of my mom's old vintage supplies that could be done the same way, they are also Red and from the 1950's. Hummm? I'm thinking! 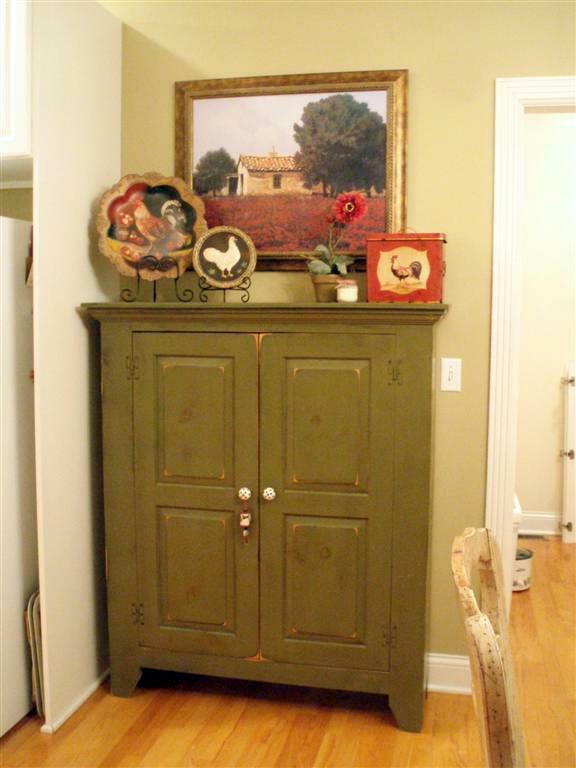 Third, The green hutch in your dinning room? Did you do that one too? Is it food storage or does it hold plates and glasses? Fourth, the colors you picked out is perfect! I have so much to say about your room, OMG, it's just beautiful! Oh, I just saw Melissa Miller above me, shot out to her for me! Hey Mel or Miss M! Amazing! And, on a rented home. We haven't sold our house so may have to lease when transfer time comes in September. I hope we find someplace we can transform, too. Very nice! !I like the details...loved the cabinet knobs also and the green hutch in dining room...GREAT JOB! This is beautiful! Really makes me want to add some warm, cozy colors to my kitchen! Charming. So talented, very warm, well done. Wonderful transformation! Each little detail is so carefully thought out. I can see why you are pleased! It really looks terrific! Oh my! I just love this too! I was just visiting your table post and kept on peeking around! What a beautiful transformation! 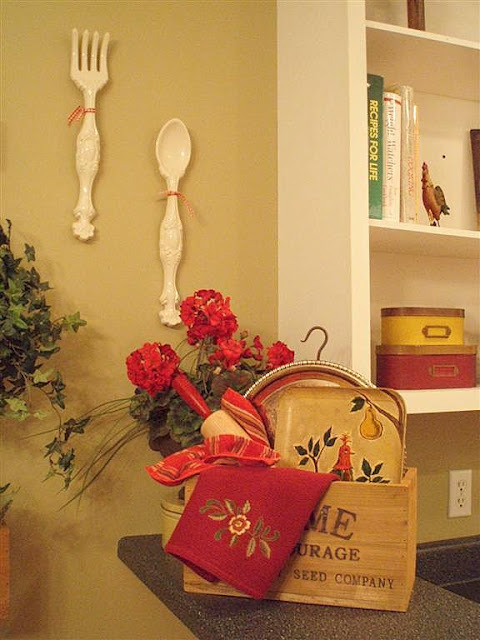 I think what I love most are allof the details you use in a room! I think that i really what takes a room from great...to beautiful...and you are wonderul at this! I would love if you would stop by sometime...I have your living room bookmarked as one of my favorites and I would love to meet you! I adore your blog! 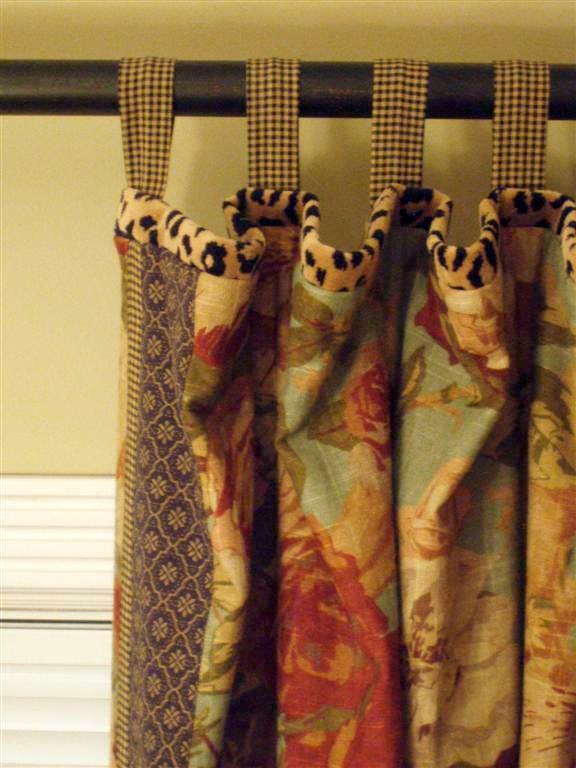 Beautiful work, where did you get the fabric for your drapes. That is one beautiful kitchen, thank you so much for all of the wonderful pictures. 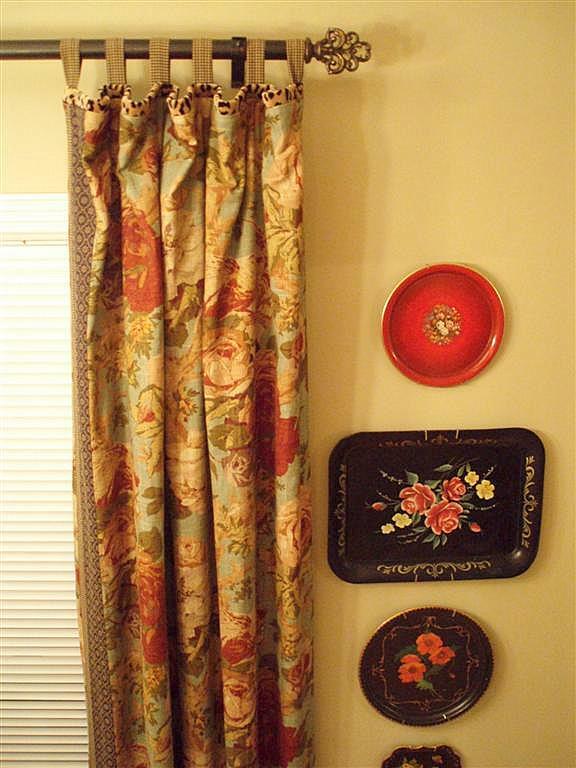 Do you by chance remember what the name/brand of the main curtain fabric is??? 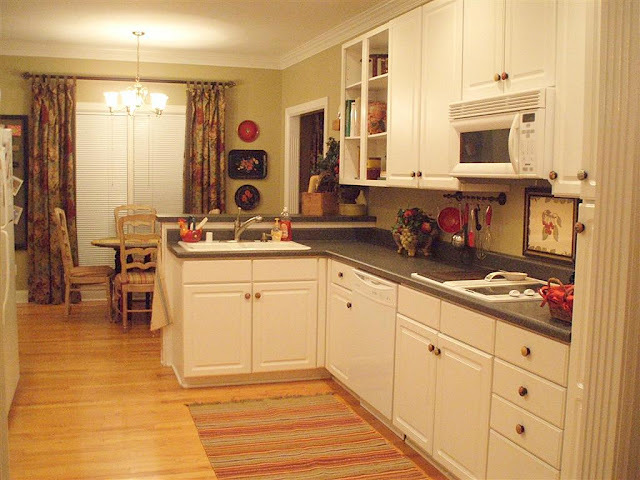 You kitchen is beautiful!!!! I love how it is filled with warmth! I'm your newest follower! Iam here to see again a valance topper I saw before. I would like to see it again. any help in quick find. two fabrics. scalloped dips. It loos lovely! I really like the drapes. 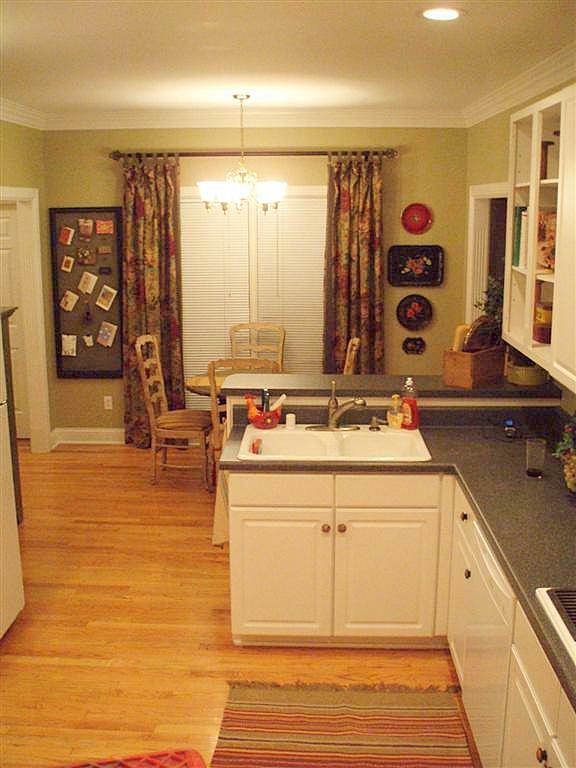 Oh, I DO love your kitchen! It IS very similar to mine! The whole space is so cozy and cheerful! We DO have Bed and Breakfasts, don't we? By the way, I stole your B&B sign wording (the one in your Guest bath--too too funny)! BEAUTIFUL!!! I can't wait to hear about the table!! I have a table top that I'm going to redo!! 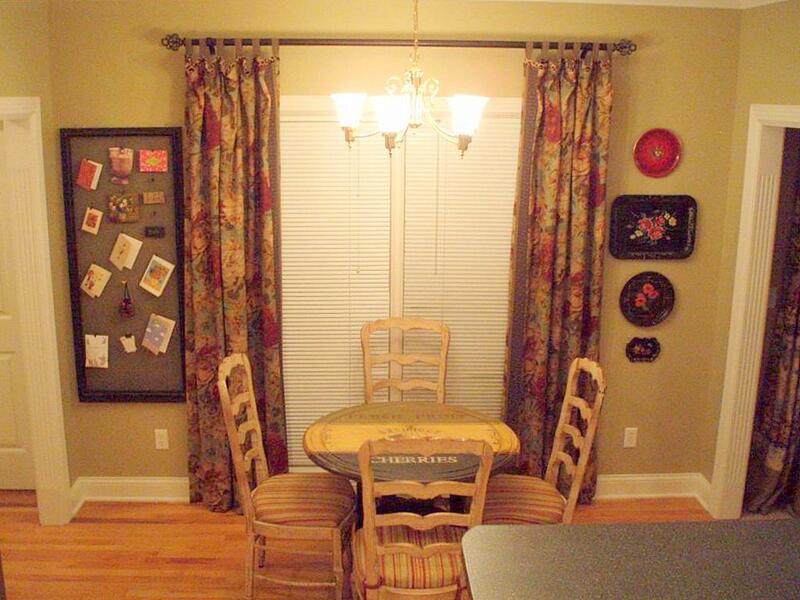 I love the dining area. The curtains, the table, the hutch.....love! love it all. well done! That is amazing! 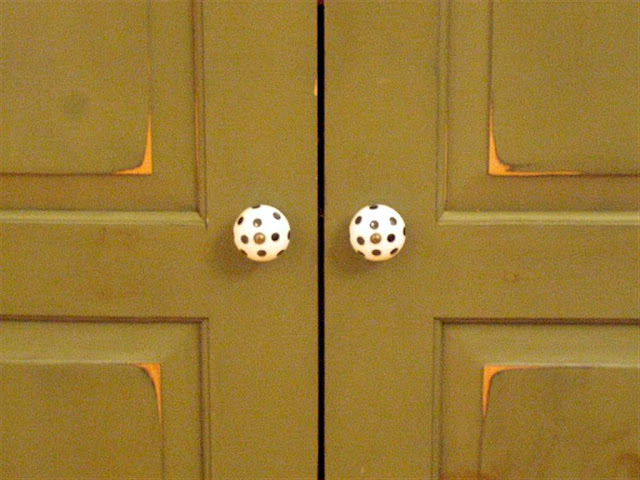 And, I'm sure it has been said before, but let me say it again: I LOVE those doorknobs! How incredibly darling are those? Fabric! Who'd a thunk it. WOW!! 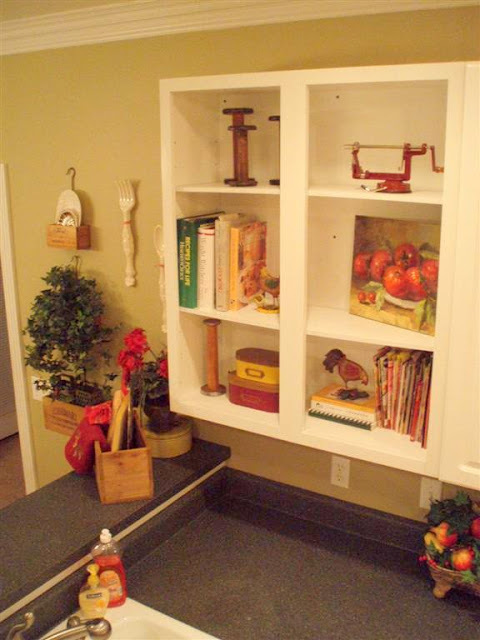 Truly beautiful..you did such a great job...I am in the middle of redoing my kitchen..it's so fun..